Kawanabe Kyosai (1831 - 1889) Two Battling Warriors: Muramatsu in Foreground from Genroku Yamato Nishiki, 1886. Oban. This is an outstanding and astonishing print from the less well known but hugely collectible artist Kawanabe Kyosai. A pupil of Utagawa Kuniyoshi and son of a samurai, Kyosai was a political satirist and famously described as “perhaps the last virtuoso in traditional Japanese painting”. Some consider him the natural successor to Hokusai and as the first political caricaturist of Japan. 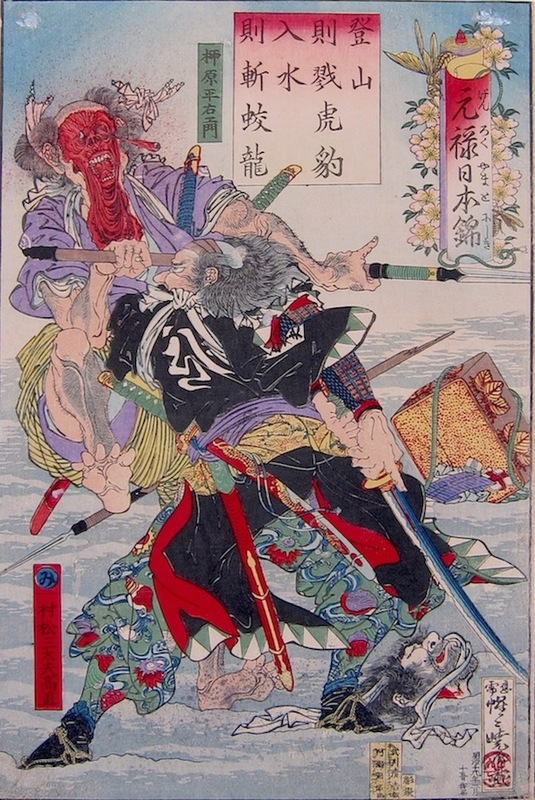 This series is derived from Kuniyoshi’s great series of 1847: Stories of True Loyalty of the Faithful Samurai which depicts each of the leaderless Ronin during their assault on the palace of their enemy Kira Kozukensuke. The Kuniyoshi series is interesting in that despite making over fifty prints on the subject of an assault, we never get to see combat or opponents. Kyosai more than compensates for this in this series. In each of the prints he illustrates one of the leaderless samurai (often in identical poses to the originals), but engaged in lurid, violent and explicit detail. 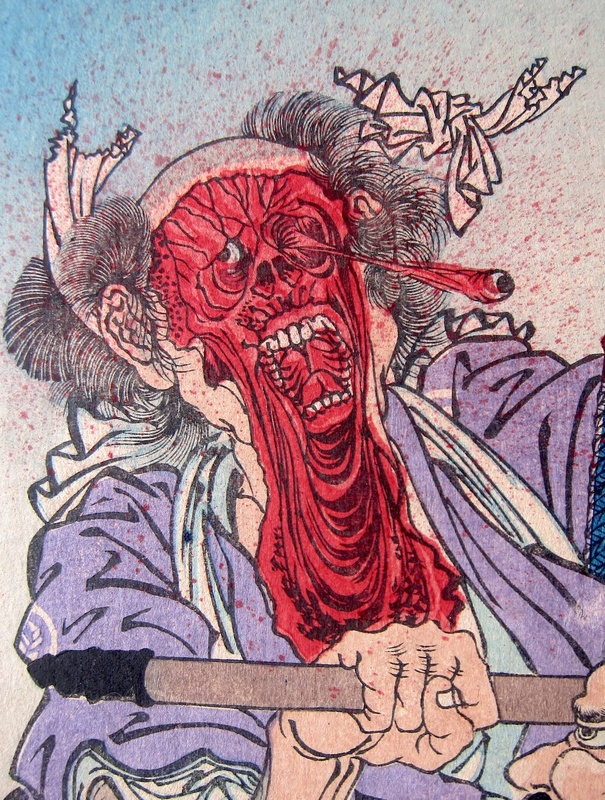 In this extraordinary print, no detail is left to the imagination of the viewer - the masterpiece of the series and a groundbreaking artwork in Japanese art, the image shocks us into contemplation… the question here is how much of the graphic violence is satire and how much is merely gory prurience? Interestingly, probably a little of both. Coming from a samurai family and being highly politicised, Kyosai was arrested by the new Meiji government for subversive cartoons. There is perhaps something of the sense of the old, and honourable samurai here strangling the life out of the new demon of modernisation. Certainly, Kuniyoshi’s quietly incompetent Ronin have been replaced in Kyosai’s world by angry and vengeful assassins. This is just a great print. The quality of the drawing is peerless and the strength of the design - the shooting right/left diagonal and the star burst clutter of swords and weapons are masterful. All of this violence and bloodshed is however set against a delicately drawn floral cartouche with certain and deliberate irony. A fine early edition, superb colour and impression with some virtuoso shading and block cutting. The print is full size and aside from small tape residue marks in the top corners, is in excellent condition.